So here it is, the much anticipated debut album from Roska, raiding his armory for a massive collection for the Rinse crew. His status as a leading progenitor of the UKF scene is now well documented, garnering well-deserved recognition for his role in reprogramming the patterns of dancefloors from Glasgow to London with a blend of ultra modern tribal-house and garage-indebted rudeness. 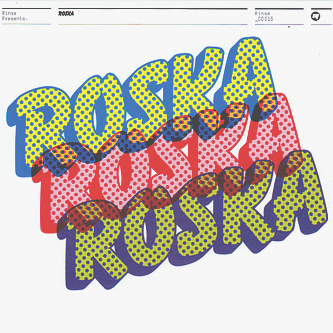 'Rinse Presents Roska' gathers the previously released single tracks 'Love 2 Nite' and 'Wonderful Day' next to eight brand new cuts written through with a definitive 2010 flavour. We can largely divide the album between vocals and instrumentals. Jamie George lends a deeper house element to the aforementioned single tracks, while Anesha drapes herself over the jazzy Broken Beat style chords of 'I Need Love' and Nikki sails modern soul vox over the well-heeled 'Energy'. However, we find all our favourites in the instrumentals, with the carnivalous blurts of 'Squawk', the Afro heat of 'Hey Cutie', and slow-burnt groove of 'Messages' keeping us pinned to the floor. No doubt, after Geeneus' 'Volumes 1' this is one of the finest UKFunky long players you're going to find. Recommended.